[Continued from 12.7.13] In so many ways, making a cloth doll is easier than making a quilt. Maeve was made over the course of 5 days, amid other activities and obligations. My small quilt took weeks. Quilts, I'm thinking, always tell one's own story. Dolls somehow put you in touch with some "other." Of course, you can look upon dollmaking like any other mode of production: patterns, decisions, get it done. But I'm in exploration mode, so I'm trying to open up and let the process itself inform all those little decisions about what fabric, what face, what embellishments. It's fun to think little wandering fairy spirits like the cut of my cloth and whisper sweet instructions in my ear to construct bodies to their liking, that they might then inhabit them. Did I hear a spirit talking to me this week? No, but I paid attention to what songs popped into my head (old British Isles folk songs) and what little pieces of jewelry junk grabbed my attention (the small key). I think the pattern I used was supposed to make what looked like a jazz dancer. But my eye was drawn to a pack of little fabric squares labeled "Kansas Troubles" -- not jazzy at all. And at the yarn shop, it was the variegated red wool that caught my eye. And so, the spirit of Maeve imbued my doll. Maeve was a busy, practical woman who wore thrift-store britches and had no time to style her hair. She got a kick out of the fact that she repurposed her wedding veil into a skirt (and that it had a longer life than her dearly departed husband). Her layered shirts, her green silk scarf and her red leg warmers protected her from the drafts in the big old inn that she ran in the chilly west of Ireland. Her red slippers helped her move fast. And she always wore her master key on a cord around her neck as a reminder of her authority and a pledge of responsibility for her guests. In the early 20th century, the widow Maeve was a feisty advocate for the Irish Free State. Her inn was regularly used as a safe house for IRA members escaping the ruthless Black and Tans. In fact, this was how she met her maker. One night, with two fugitives hiding upstairs, a couple of Black and Tans came in and asked for drinks. They got drunk, belligerent, and then assaultive. She knew if she screamed, the fugitives would come to rescue her and they would be killed. So she clenched her jaw and battled silently. In the end, one of the men grabbed the key cord around her neck and strangled her. In the silence that followed, Maeve's ghost appeared to the men upstairs and told them to escape out the back window, thus saving their lives for sure. And so the spirit of Maeve roams, with her open arms of generosity and and promise of protection. Now she has awakened my little doll and inspired me with her tale. Maeve is an elementary pancake style doll, meaning she has a pretty flat head and flat face. 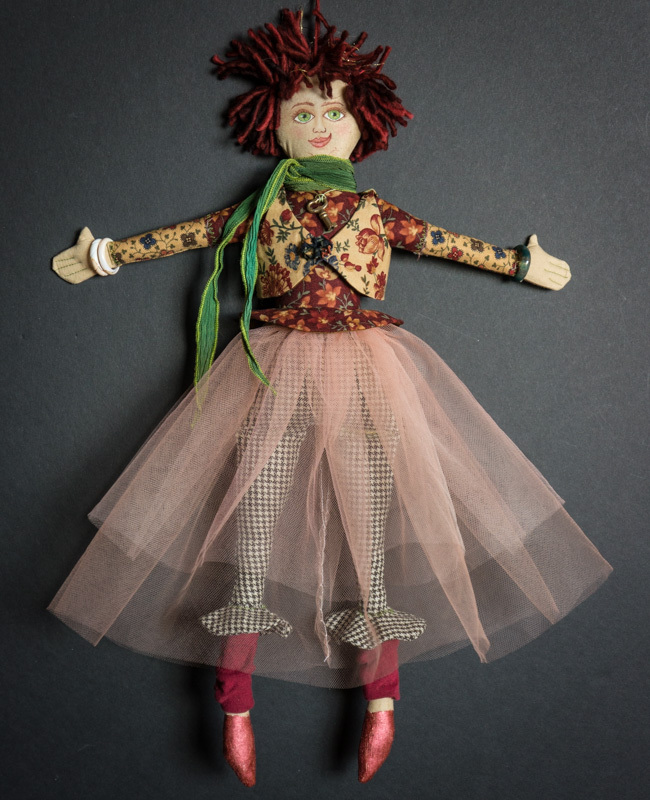 She's based on a pattern by eleanor peace bailey in the book Cloth Doll Workshop. She's about 18" long. The body is constructed of unbleached muslin, dyed with instant coffee. The shirt and pants were appliquéd onto the muslin prior to being sewn together and turned right-side out. The body was then stuffed with Fairfield Poly-fil. Fabric: The shirt/sweater and vest fabric are from the Moda Kansas Troubles Quilters line. The pants are scraps from an old skirt of mine and her leg warmers were cut from an old t-shirt. Her skirts started out as ivory tulle, which I decided to dye with a combination of instant coffee and RIT (scarlet + tangerine). The peplum and vest are lined with the lining from another of my old skirts. The flower closure on her vest is a "yoyo," a tiny circle of gathered cloth. Feet: coated with gesso, then painted with Lumiere Metallic Russet fabric paint. Face: done with Micron Pigma pens and Prismacolor pencils. Hair: burgundy worsted wool from Merino, with a little gold thread added. Accessories: The key and the rings used for bracelets came froma cache of bits and pieces saved by Jim's mother. The green silk ribbon (neck scarf) was found in my ribbon and cord box. The sewing is mostly straightforward machine work, though it's a little tricky to work with a 1/8" seam allowance. Some teensy hand stitching is required, which took me a while to get the hang of. I'm anxious to make a "profile" doll (i.e., one with a nose!). With the next step up also comes the option to add an armature (wire, dowels or pipe cleaners), so that the doll is jointed and can be repositioned. No, I don't HAVE to. 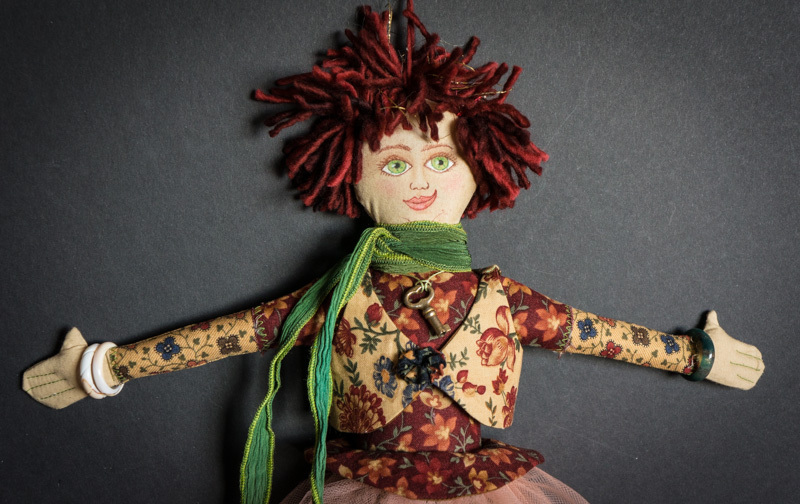 There are plenty of lively and whimsical dolls that can be made with very basic patterns. Making a doll for me is more about liveliness than perfection. But the touches of realism in a doll's face -- like that little white glint in the eye -- are what make it come to life . Making a doll isn't hard. It's just lots of steps. It's a craft for a detail-oriented person with an active imagination. As I said in the beginning, this little streak of dollmaking is not production-oriented. I have no list of people I need to make dolls for. The process feels too slow and absorbs too much of me to hand off -- but maybe that will come. Right now I'm just exploring, enjoying my second childhood, I guess. Anyway, if you have access to a sewing machine, make a doll. And let him or her tell you a story.